So, my last post featured one of my favourite fall outfits and here is one of my favourite shirts of all time, especially for right now though. 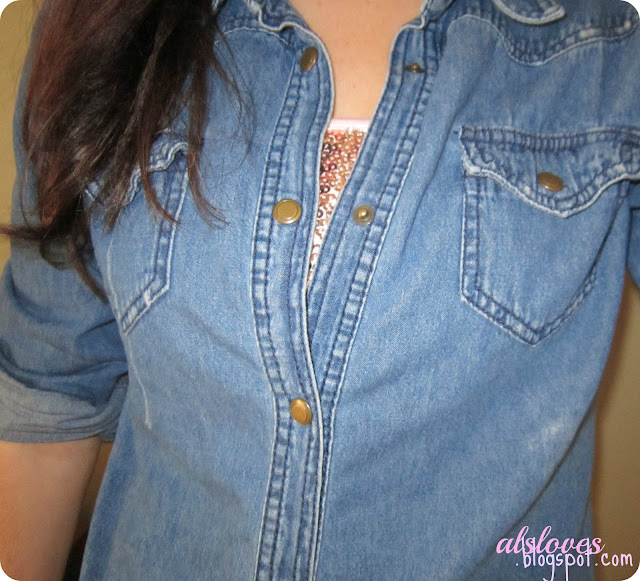 Denim shirts are popping up everywhere this fall but I got this shirt from the Miley Cyrus Wal-Mart line ages ago and find a place to wear it in every season. The way I paired it recently was with a sequin bandeau underneath from Forever 21, I have a bit of an obsession with sequins and this is the perfect amount for casual wear without getting too crazy, and I just love it. Another thing I have been loving is Cheetah accent nails, I feel like cheetah/leopard pops up every fall/winter and this is my favourite way to wear it. The Beauty Department has a great post on how to achieve it that is super simple and easy to do on both hands, and that is how I learned the technique. The black I used was OPI Black Onyx, Gold is Joe Fresh Sun Kissed and the base of the cheetah is Joe Fresh Latte, but I'm sure you can use whatever is in your collection to recreate it. I have had nail art on my nails pretty much everyday for the past 6 months it seems, and have tons of photos to show off to you guys soon, and am really excited to experiment with holiday nail art and already have some on my nails even though its still November hah. Anyways hope you enjoyed the little glimpse of my OOTD /NOTD, leave a comment below I'd love to read it!